Swan Hill Regional Art Gallery will be transformed into an immersive and interactive gaming zone from this Friday, thanks to Code Breakers: Women in Games. The ACMI exhibition is the first of its kind celebrating the achievements of women in the gaming industry. 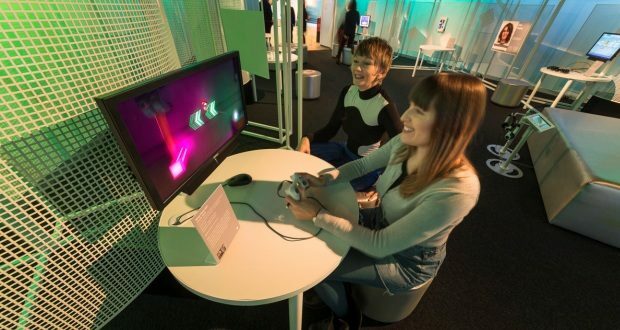 Visitors can get hands-on with an array of playable games – from indie through to commercial hits and new releases – all made by Australian and New Zealand women working in different capacities: as directors, programmers, developers, digital artists, writers, producers and designers. It offers something for everyone at every skill level. Deliver pizzas and crush bullies in Ninja Pizza Girl, join an animal clan in Armello or race souped-up cars in Need For Speed: No Limits. Preview some of the Code Breakers games. Rebecca Fernandez, a games programmer who worked on PS4/Steam titles Tricky Towers and Armello, said she hoped it helped inspire girls and women to start making their own games. “I think this exhibition is an excellent way to give Australians a peek behind the curtain of game development, and highlight that women are playing an integral role within the industry,” she said. Gallery Director Ian Tully said Code Breakers would be the second outstanding ACMI exhibition to visit Swan Hill. “To be able to bring this high-end interactive gaming to Swan Hill and to celebrate women in game design is extraordinary. I have no doubt that people will be able lose themselves in this interactive exhibition,” he said. The game makers featured in the exhibition include: Lisy Kane, Producer at League of Geeks, co-founder of Girl Geek Academy and one of Forbes’ 30 Under 30 in the games category; Katharine Neil, independent Game Developer and director of the hugely controversial and influential game Escape From Woomera; Maru Nihoniho, Founder and Managing Director of Metia Interactive and recipient of a New Zealand Order of Merit for her service to the gaming industry; and Siobhan Reddy, Co-Founder and Studio Director of Media Molecule, named in Fortune’s 10 most powerful women in gaming. Code Breakers: Women in Games will be on at Swan Hill Regional Art Gallery from 8 February until 24 March, and entry is free. Code Breakers has been curated by ACMI in collaboration with an advisory committee consisting of key industry figures Kate Inabinet, Animation and Games Industry lecturer at RMIT and creator of education based games for children; Helen Stuckey, media arts curator, researcher and Program Manager of Games at RMIT; and Leena van Deventer, a game developer, writer, educator and Co-Director of WIDGET (Women in Development, Games and Everything Tech).